I have a relatively large family, which can make the holidays a overwhelming– both emotionally and financially. To help with the second, if not the first, all of the adults in the family pick only one person to buy for with a $20 spending cap. We usually find out well in advance who our yearly assignment is, but this year my list slipped through my email. I only found out that I was giving Correy’s gift last week. Now, if you hadn’t noticed, Christmas is fast approaching. I have scarves ready for two of my nieces which will be easy to block out and wrap up for the holiday. I had a rough idea to start Correy’s scarf next, but I didn’t realize that I really had a deadline. 10 weeks to complete the project. This means I had to pick a project. I spent the past week starting a pattern, ripping it up, making modifications, ripping it up, choosing a new pattern, etc. until I finally settled on Helen’s Grey Loop Pattern. 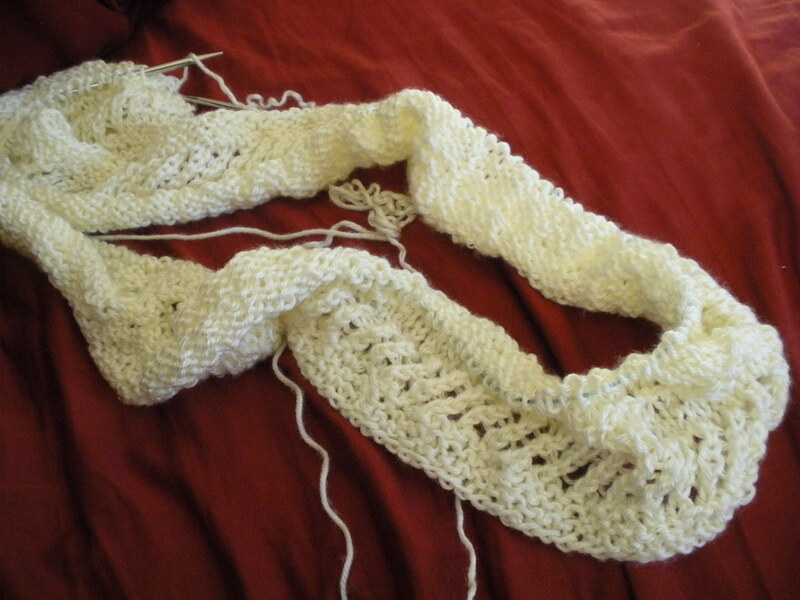 After a miscalculation in size that cost me a few days, I finally started (what I hope is) the final eternity scarf. My only change to the pattern is that I’m knitting it on US10 needles. This is my progress after one day. It knits up pretty quick, so I think it will be done in time. Hopefully I’ll be able to knit a tam as well to make it a set. 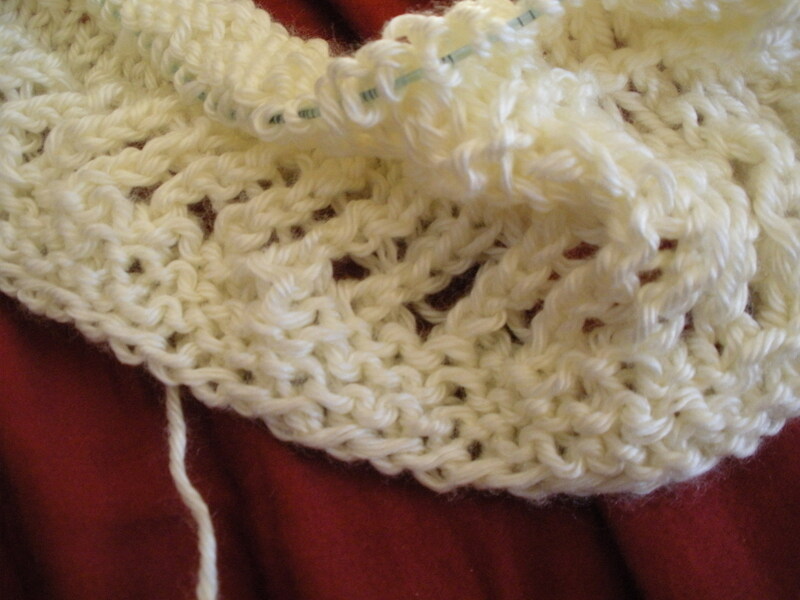 The lacework is a simple pattern, just YO, K2Tog around for 5 rows. But it comes out really cute. So far I’m pretty happy with it. While I was designing I looked at a lot of lace patterns but none would show on this yarn, this pattern comes out subtlety, and hopefully will show better once I block it.